When we need a little warmth and comfort, what do we reach for? A hoodie. Always a hoodie. We feel so cozy when we pull it over our head and slip our arms through the sleeves, which is great! But then we look in the mirror and don’t necessarily love what we see, style-wise. We can’t say any old hoodie is a fashion statement, but we can say that some are. Especially this one. The Adidas Originals Cropped Hoodie is a sweatshirt we can actually wear outside of our home with pride and pizazz. We feel like no matter what time we go out to run an errand, we end up running into an acquaintance we’d rather not see, especially when we don’t look our best. We end up using the hood of our sweatshirt to cover our face more than to keep us warm. This Adidas hoodie, however, has us feeling so confident that we might actually be the first one to say “hi” next time. 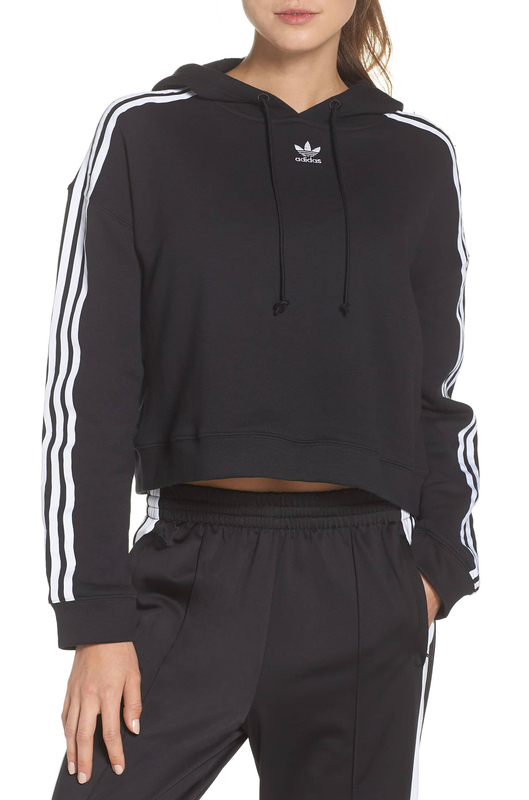 See it: Get the Adidas Originals Cropped Hoodie in two styles starting at $60 from Nordstrom! One shopper said this hoodie met all of their “requirements,” while another said it looked exactly the same in real life as it did in the photos. Isn’t it so annoying when you order an item and it ends up being a totally different color or fabric than how it looked on the website? No worries here! What you see is what you get, and we definitely like what we see. Another shopper said they love this hoodie for an option when they have “nothing else to wear” or are “feeling lazy but still want to look put together.” Bingo! That’s this hoodie’s specialty. This cropped version of a classic hoodie is cut from “amazingly soft, brushed jersey.” It’s 100 percent cotton, so it’s very breathable, but it’s more than thick enough to keep us warm. Even though it’s a super cute sweatshirt, it’s not just for show. Because of its relaxed fit, it’s also great for layering. That goes for clothes underneath and on top. Slip on a tank top or long-sleeve tee underneath and/or follow up with a denim jacket on top. Extra chilly? This hoodie will fit perfectly under a puffer coat, too, to shield us from icy winds. This hoodie is pullover style, so we can just slip it over our head. The cropped hem hits just above most waistlines, which makes it a flawless choice to pair with high-waisted pants or leggings. Of course, we’d also pair this with our favorite Adidas pants for a trip to the gym or a jog around town (or for just lounging on our couch). This is also a great choice for quickly throwing on after a workout instead of spending an extra 20 minutes in the locker room zipping, tucking and buttoning. This hoodie comes in two styles, which vary more than enough that we can get both and wear them one after another without being “outfit repeaters.” For a more traditional athleisure look, we can choose the black version. It features the classic three stripe design Adidas is synonymous with down the outsides of the sleeves, as well as a small logo just under the neckline. The hood drawstrings are skinny and fall mid-torso, and we can, of course, use them to adjust the hood’s fit. For a much more colorful option, we can get a minty-cool Vapour Green. As opposed to the three stripes, this version has thin gray pinstripes throughout. They’re on the hood too! Also, instead of a small logo, this version takes a more sports jersey approach with a semi-script, underlined logo crossing almost the entire chest area. This “Adidas” is a shiny, bright teal, which complements the mint color of the cotton perfectly. The drawstrings are thicker and longer on this style, with frayed ends that add to the look, not just the functionality. The brightness of this version also makes it suitable for spring or summer, but its wintry mint more than suits colder weather as well. We love each version of this hoodie so much for so many different reasons, but we’re grateful for what the two have in common as well, which is their cute cropped fit, undeniable comfort, high-quality material and outfit-enhancing capabilities. With a hoodie like this, we feel like we can truly have it all. Bring it on, world! 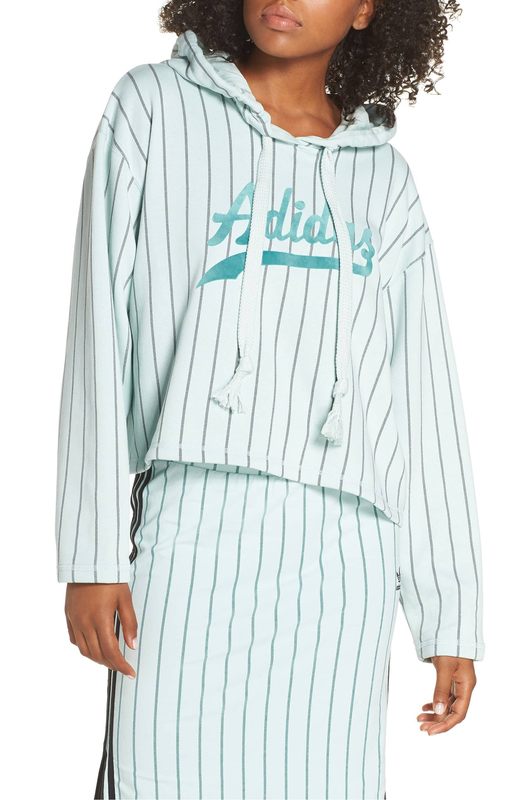 See it: Get the Adidas Originals Cropped Hoodie in two styles starting at $60 from Nordstrom! Not your style? Check out other activewear from Nordstrom here!